City of Katy Mayor Chuck Brawner, Costello Inc., and nearly 100 members and guests gathered at YMCA at Katy Main Street to discuss flood mitigation plans for Katy. The sparkling new YMCA at Katy Main Street played host to the Katy Area Economic Development Council General Assembly meeting on Tuesday, November 14. Nearly 100 members and guests gathered to hear numerous updates including a special presentation from City of Katy Mayor Chuck Brawner and Costello Inc. focusing on flood mitigation plans in the city. Mayor Brawner along with Stephen Wilcox, Partner at Costello, and Ralph Saldana, Costello District Engineer, shared information on strategies to reduce flooding within the City of Katy. In the short term, the city hopes to mitigate flooding through steps such as increasing detention pond capacity, improving culvert and ditch drainage capacity, and improving storm sewers. Special attention will be given to areas which have been most adversely impacted during flooding events such as the Pine Forest, Fortuna/Patna and 1st Street areas. On a larger scale, the city and Costello continue to evaluate long term solutions with a regional focus. The solutions proposed such as a third reservoir and large-scale drainage channel improvements will require greater funding and cooperation with municipalities and entities from throughout the entire West Houston area. Regional flood mitigation planning is ongoing and area leaders are focused on identifying funding sources to make proposed projects possible. In addition to the presentation from the City of Katy, YMCA at Katy Main Street Executive Director Pam Filip shared information about the newly opened YMCA, one of the newest in the Houston area. The YMCA, located in the Katy Main Street development within the City of Katy, offers a wide variety of programs for children and adults. You can learn more on the facility and its offerings here. Several new members were introduced at the meeting including Newland Communities which upgraded to the Board of Governors level, and Associate members 365 Coffee, Toulnay Engineering Group, Inc. and The Harvey Housing Recovery Project. Membership renewals recognized included Board of Governors member Fort Bend County Commissioners Court as well as Associate members Christ Clinic, Pin Oak Atrium, Raba Kistner Consultants, SCI Dignity Memorial and Times Square Entertainment. Outgoing Board of Governors member, Don Massey, was also recognized for his years of service on the board. 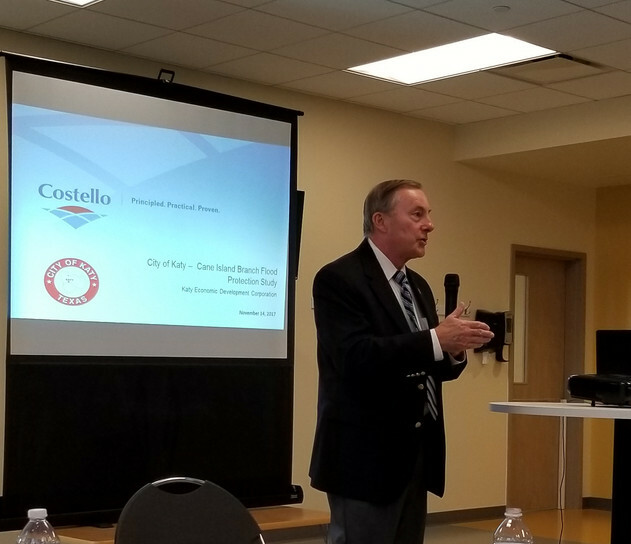 Costello Inc. served as the breakfast sponsor for the November GA. Costello is full-service civil engineering and surveying firm provide a board range of services. Learn more about Costello at costelloinc.com.